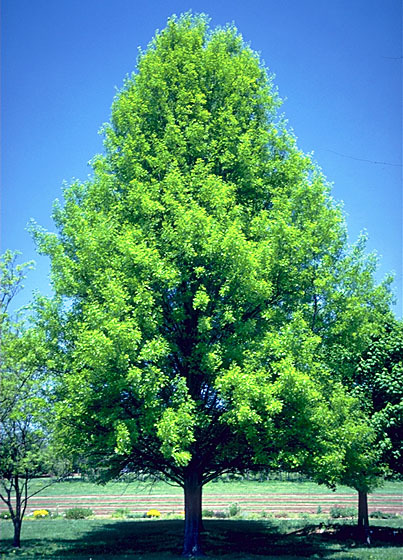 Pin Oak also called Swamp Oak has a fast growth rate for an Oak, maturing with a broad round crown at about 60-70', leaves deeply lobed, turning an attractive copper-yellow or red in fall. Pin Oak is probably the best of the northern oaks for fall color. Pin Oak acorns are on average 3/4" across. Will tolerate a wide range of soils but prefers moist soils. 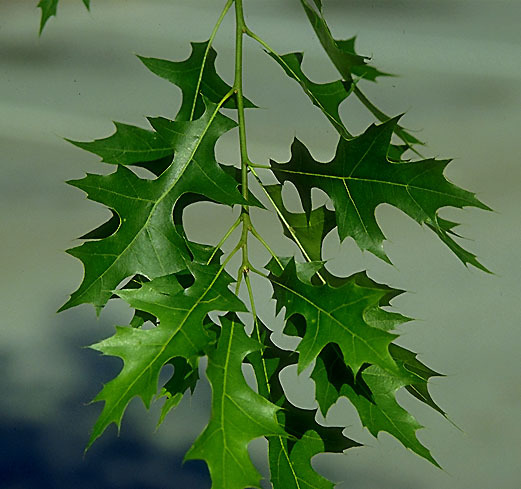 Well-adapted to alkaline soils, poor drainage, and high clay content, Pin Oak is also very drought-tolerant. Pin Oak grows best in full sun. Excellent lumber tree. Always prune Oaks while dormant to protect from Oak wilt. Pin Oak can be easy to transplant because of the shallow taproot. Pin Oak is probably not a good Oak for windy areas due to the shallow root system. If you are planning to grow Pin Oaks for landscape sales we highly recommend our root growing bags for easy transplanting. We also have: Burr English Oak, English Oak, Willow Oak, Chestnut Oak, Columnar English Oak, Shumard Oak, White Oak, Swamp White Oak, Pin Oak, Northern Red Oak, Heritage Oak, Regal Prince Oak, Rocky Mountain White Oak, Oregon White Oak, Burr gambel Oak, Scarlet Oak, Northern Pin Oak, Bur Oak, Chinkapin Oak seedlings. To buy pin Oak seedlings and transplants use the table below. To order Pin Oak seedlings by PHONE: We're glad to take your order by phone. For your convenience, we have a toll free number 800 568-9179. Phone orders can be charged to VISA or MasterCard accounts. Shipping & Handling: Most orders are shipped UPS. The large 5-6' Pin and Red Oaks have to ship by truck so call for freight prices. Make sure we have your street address and a daytime phone number.